We are proud to present below, the first in a series of user manuals that will help you get to know LogicSMS. If you already have registered on the website and have a username and a password, proceed below to the login section. Click here to skip the login section. 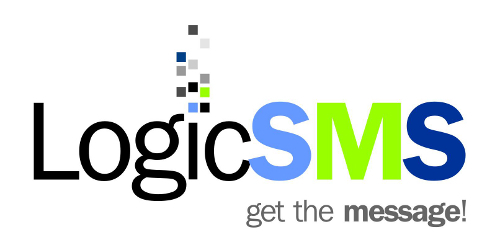 If you are new to LogicSMS click here to learn about the sign up process or click here to learn about the services LogicSMS provides. 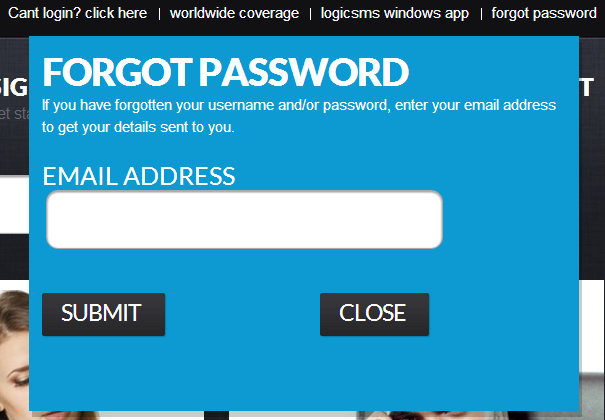 If you have any difficulties logging in to your account, please contact our support team by email or phone which you can find by clicking on the contact button at the top right of the www.logicsms.co.za homepage. Click here to goto the contact page. button, at the top right of the www.logicsms.co.za homepage. Click on the close button to close the forgot password feature. If you don’t receive this email, please check your spam/junk folders or mailbox. If you have any difficulties retrieving your username and password, please contact our support team by email or phone which you can find by clicking on the contact button at the top right of the www.logicsms.co.za homepage. Click here to goto the contact page. 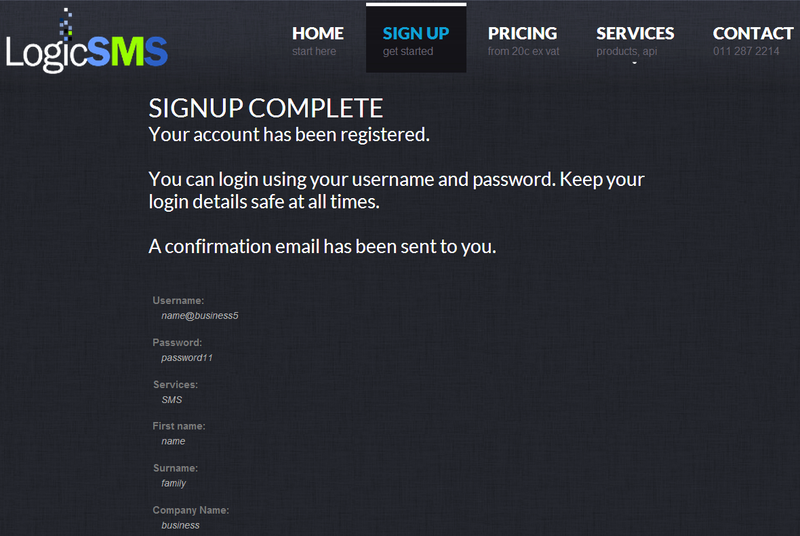 If your email address that was registered at signup has changed and is no longer in use, please notify us by email containing both the email address that you registered at signup together with your present email address, using the contact button top right of the www.logicsms.co.za homepage. Click here to goto the contact page. These short cuts can be used to jump to any of the listed services. 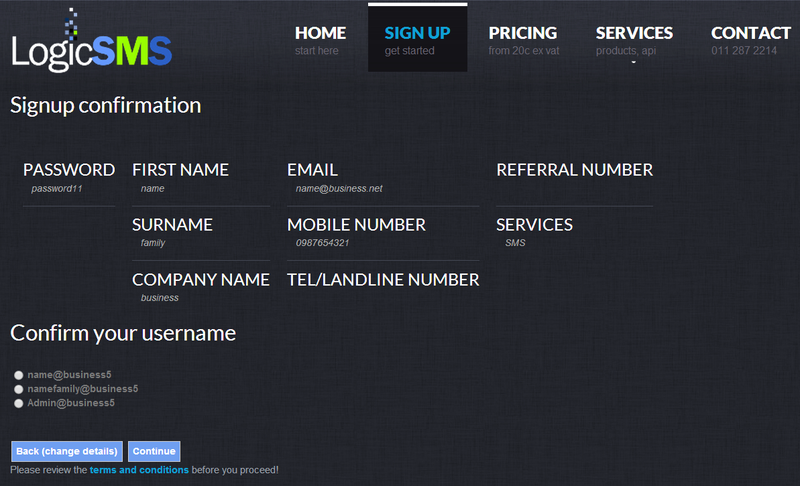 To review the services overview page click on the services main menu at the top right of the www.logicsms.co.za homepage, and a new page will display a summary of the services. Click on the blue headings to view more details of each service. Using Bulk SMS you can easily send sms messages to one number or large numbers of sms to groups of cellphone numbers from your own files or from your address book inside your account. Also you can upload batches (ftp), also send batches using the campaign manager and track your campaign. Long messages above the standard 160 characters are easily managed. Replies are supported. All replies can be viewed in real-time online at anytime. Replies can be forwarded to your preferred communication method; email, cellphone, server (api). Messages can be scheduled for sending in the future for events such as birthdays, appointments, reminders and confirmations. Comprehensive reports allow you to review the status of each message sent as well as the date and time sent, the charge and message length, both for send and scheduled reports. A premium sms enables you to create an sms line which will allow customers or target market to send you an sms from their cellphone. 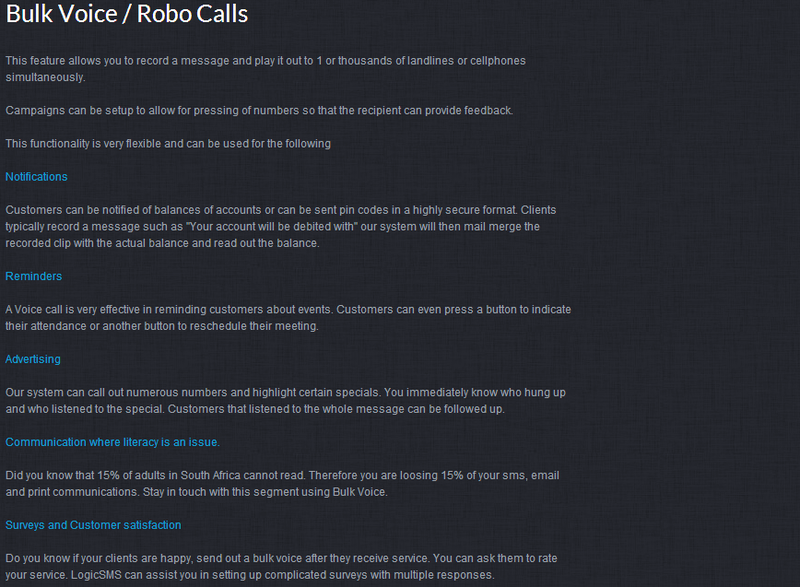 Once received you can perform a number of tasks on the message or simply call them back. ​There are 2 options available for premium sms. a). Dedicated ​and Standard Rate Shortcode (a 5 digit number), click on the right of the page. The client pays for their sms according which band ​or price you have selected and they pay through their cellphone provider. You receive the sms notifications in your inbox (inside your account with LogicSMS) or to your email, or to a URL address, and automatically send back a response message which you can customize. Dedicated short codes are rented on a monthly basis. Review the downloadable order form for more details and contract. b). Shared ​Premium SMS ​short code (5 digit number), click on the left of the page. It is more economical for you as you pay to rent the keyword for 1 year, renewable. The clients need to select a predefined shortcode and enter a keyword. The keyword will be the first word that is sent in the sms. The short code is linked to the band price or charge of the premium sms. You receive a revenue share. You can record a message and play it out to 1 or thousands of landlines or cellphones simultaneously. Campaigns can be setup to allow for pressing of numbers so that the recipient can provide feedback. Can be used for notifications, reminders, advertising, communication where literacy is an issue, surveys and customer satisfaction, validation of landline numbers, sms to landlines, and more. Send well formatted emails using your existing credits. No need to know HTML code. API’s are used to integrate logicsms into your systems to allow seamless communication between you and your customers/target market. API’s are usually well understood by software/web developers on a technical level. If you have any questions, please contact support via the contact page or click here to goto the contact page now. 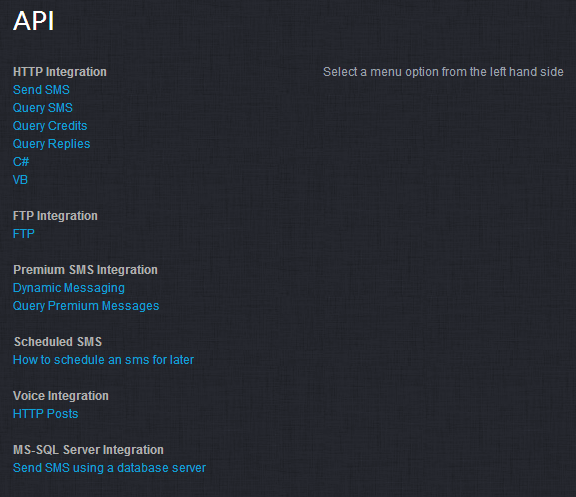 HTTP, FTP, Premium sms, scheduled sms, voice, and MS-SQL server Integration. Read more by selecting a menu option from the left hand side of the page. 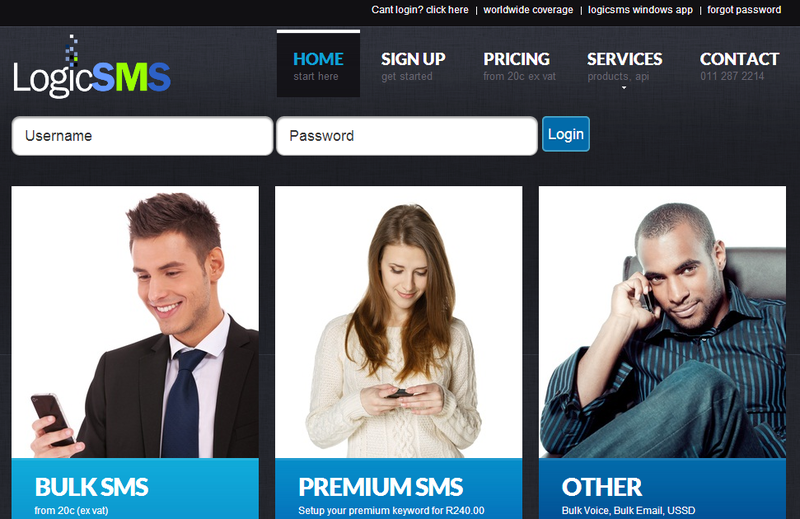 Why reinvent the wheel, LogicSMS can be branded into your own website. There are no setup or monthly fees for the reseller programme. However in order to ensure that you are a serious bulk sms reseller, we will require a minimum purchase of credits to activate the reseller program on your account. 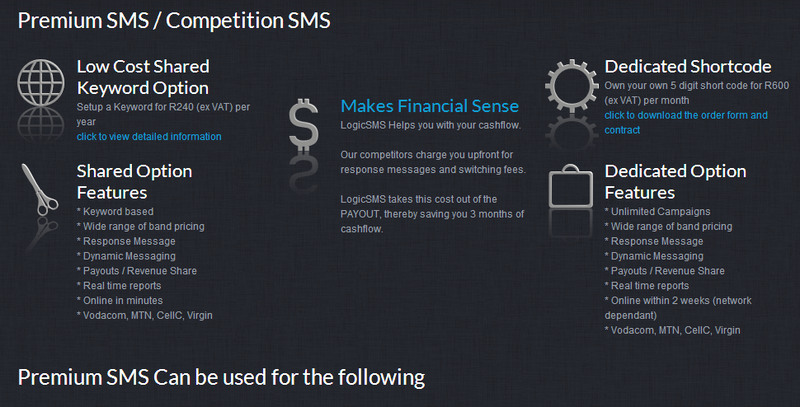 LogicSMS offers a template driven branded solution. If you require a more complicated solution, a design consultation will be required. LogicSMS pricing is structured using a tiered system. The more credits you purchase the more you get rewarded. i.e. the cheaper the unit cost becomes. 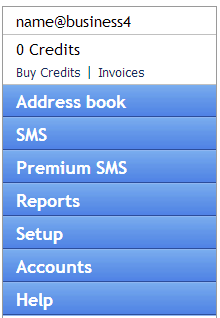 In order to make use of the paid services on the logicsms website, you will need to purchase LogicSMS Credits. 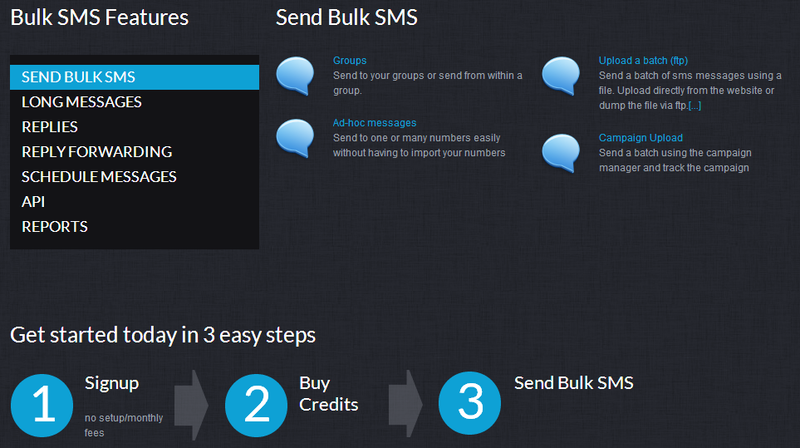 The credits can be used to send bulk sms, send bulk voice, purchase a premium sms keyword etc. To view the prices for credits, please click on the PRICING menu at the top of the www.logicsms.co.za homepage or click here to view the pricing now. Click on the SIGN UP button to open the Sign Up page, please complete this 1 page form in order to sign up successfully. This process will only take a minute or two of your time. However, if a name is already in use then alternative options will be provided for your selection. This is a special number that will link your account to that of the user who referred you to LogicSMS. Choose the services that you would like to have available on your account. This will influence the menus that are displayed on your account after you login. Can be changed later, if required. 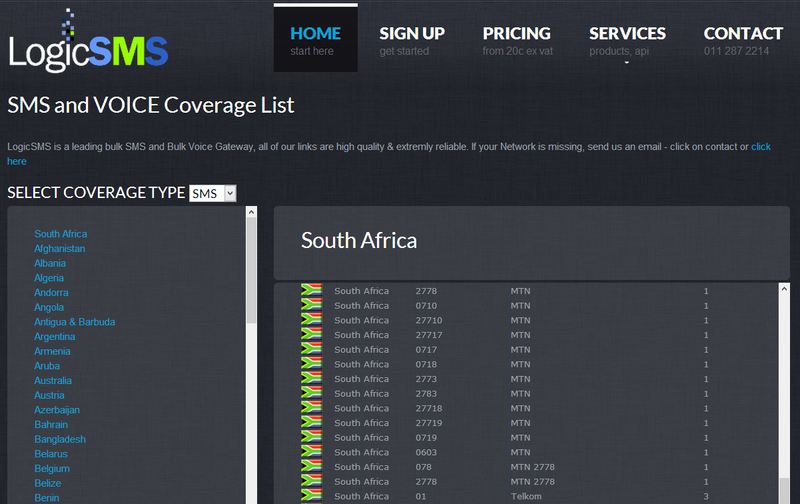 Details of these services can be found by clicking on the SERVICES button at the top right of the www.logicsms.co.za homepage. next select which service you require by ensuring the selected services are ticked/checked in the services list provided as above. Please review the terms and conditions before you proceed,Click on the button terms and conditions (which is at the bottom of this page). Once ready click on the Sign up (goto confirmation) Button. 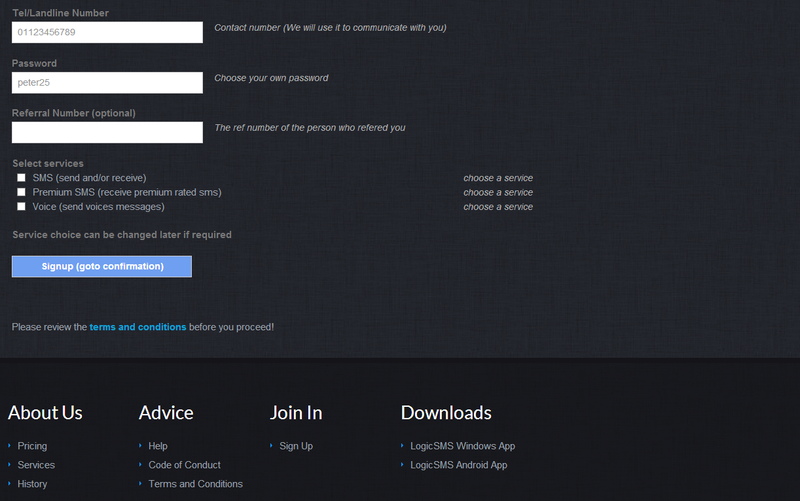 Click on the Sign up (goto confirmation) button to go to the Signup Confirmation page. Please review your details on this page to make sure they are correct. Confirm your username by clicking on the white circle to the left of the username list provided. Make sure the empty white circle is filled with black in order to select a preferred username. One username must be selected. 3. Click the back button if you would like to change any information. You will be returned to the Signup page already filled in with your details that was entered on the first attempt. Your account has been registered and a confirmation email has been sent to you that includes your username & password. 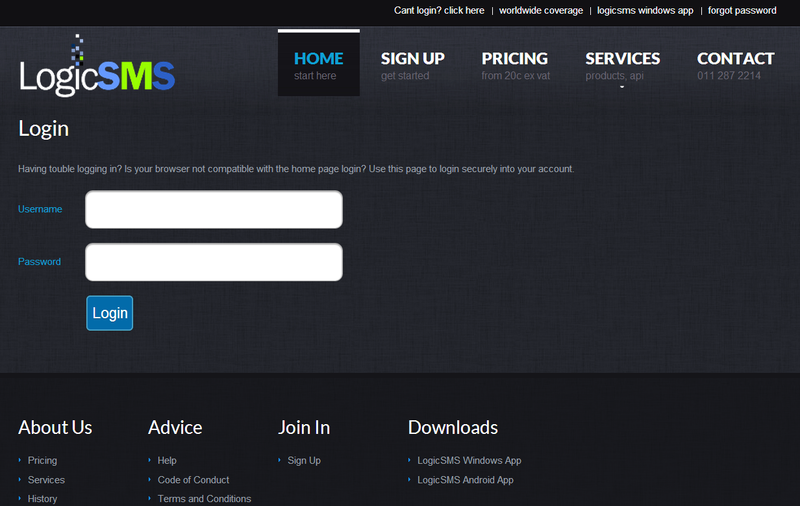 You can now login to your account using your username and password on the www.logicsms.co.za homepage. Keep your login details safe at all times. If you don’t receive our confirmation email, please check your spam/junk folders, also check that you entered your correct email address at signup. If you have not received our confirmation email after 20 minutes. 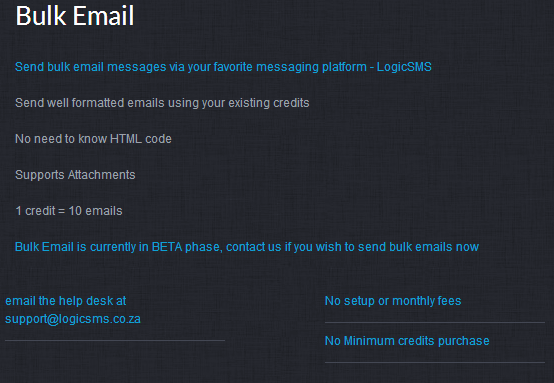 Please contact our support team by email or phone which you can find by clicking on the contact menu at the top right of the www.logicsms.co.za homepage. Previously known as LogicSMS 4 Windows. LogicSMS Windows App is an offline application that can be downloaded and installed on your pc or multiple pc’s. The following operating systems are supported: Windows 98, Vista, 7, 8.
and click on the DOWNLOAD button to download to your pc after finishing your download click the close button to close the feature. Our support team can be contacted by email or phone. 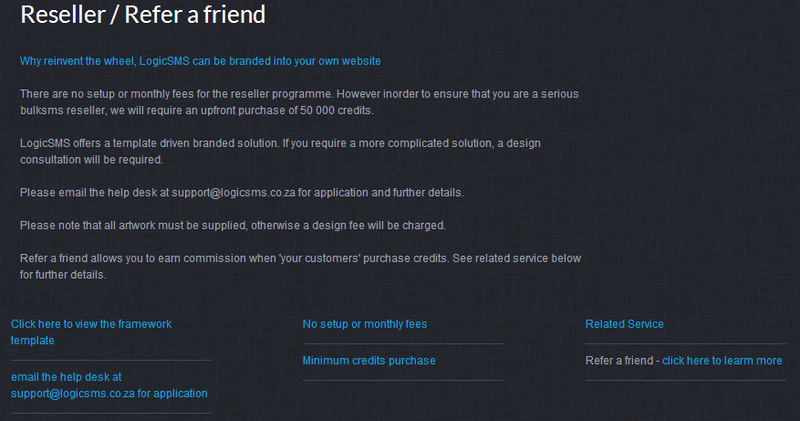 Click on the contact button at the top right of the www.logicsms.co.za homepage or Click here to goto the contact page. After hours (weekends, public holidays and holiday season) support can be contacted via the published email address on the contact page as above. Emails will be answered within a reasonable response time. To view a list of frequently asked qusetions, the at the bottom of the www.logicsms.co.za homepage click on the button under Advice and you will see a list of questions, by clicking on any of them in the Help page you will see an answer appears. Click here to goto the Help Page now. 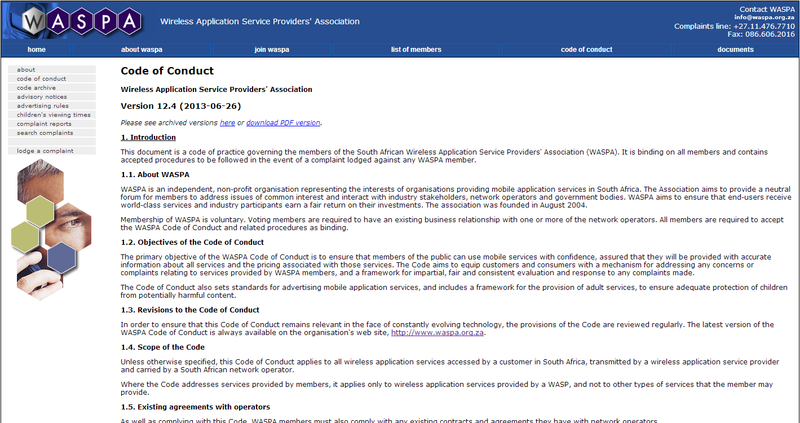 LogicSMS is regulated by the Wireless Application Service Provider’s Association, WASPA, and subscribe to their Code of Conduct. Accordingly we provide a professional service with zero tolerance for SPAM. For both senders of SMS and receivers of Premium SMS it is very important to know WASPA’s Code of Conduct in order to prevent any bad practices. Please note that by using LogicSMS services, you the user agree to observe and be legally bound by all Terms and Conditions of use, including any other policies as appear elsewhere on the www.logicsms.co.za homepage. You also agree to observe and abide by all applicable laws and regulations. 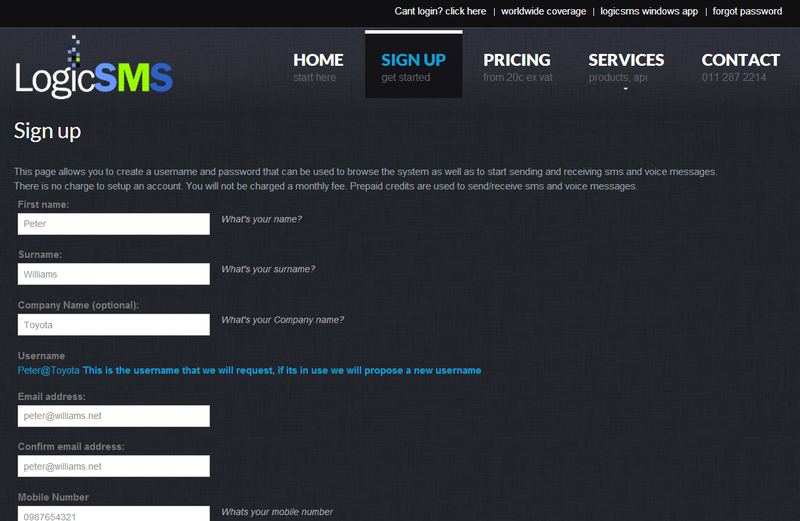 You can find the Terms and Conditions button by scrolling down to the bottom of the www.logicsms.co.za homepage and underneath the heading advice click on the terms and conditions button and a new page will open. 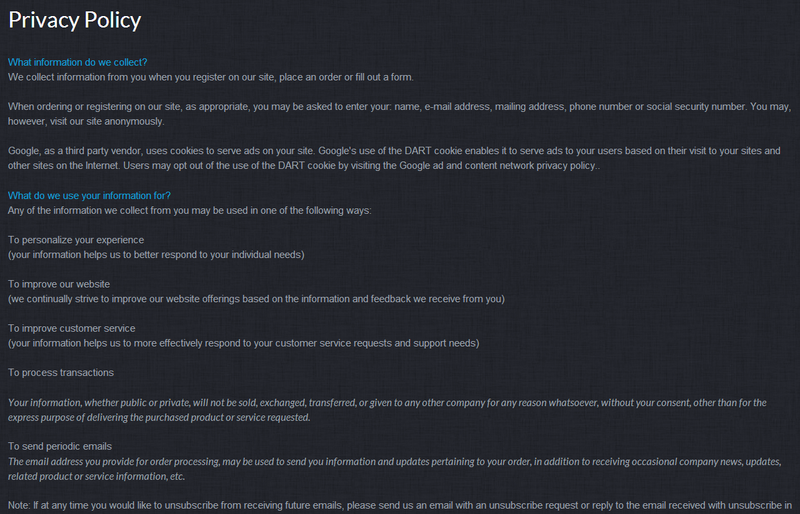 Please read the Terms and Conditions carefully to familiarize yourself with the details.